Franz Grubber walked up the two roughhewn steps from his command bunker, ducking instinctively under the low log roll door lintel and out onto the boarded observation platform. Rubbing sleep from his tired eyes he gazed out over the snow laden fields to the north. His platoon had been stationed here for over three months and they had settled into a steady routine of observation, occasional patrols and foraging in the local woods and villages to supplement their supplies. Leningrad lay some 160 miles to the north, but high command had decided to leave it be for the moment and Franz felt the war had passed him by and that his part in Final Victory would be slight. Something seemed odd this morning but his sleep befuddled brain took a while to realise what it was. Normally his gaze fell upon a vast grey whiteness of fields merging into an equally grey expanse of sky stretching across the horizon but today a thin black line separated the two. “Glasses!” he shrilled. A crash, bang and curse behind him announced the arrival of his adjutant who stumbled forward from the darkness of the bunker his outstretched arm thrusting a pair of field glasses into his commanders waiting hand. Before his assistant could turn back toward bunker to carry out the order the tank shells crashed around them covering both in a shower of snow and dirt. It seemed at last the war had found Franz Grubber. Finland & Army Norway: The Soviet defenders around Murmansk with low effectiveness through lack of supplies succumb to German mountain divisions who advance another 16 east miles south of the city. The infantry division straddling the Leningrad/Murmansk highway itself cut off comes a step nearer to relief as German units eliminate the 1-8 ski battalion which had slipped in behind it. The Finns infiltration from Ukhta is halted by Soviet reinforcements barring the advance but further south the Finns main advance again strips a stack of units from 10th Mech’s flanks which is looking exposed but still beyond the Finns capabilities to take on in a head to head clash. AGN: Last turn’s cadred divisions and the line facing the Soviet advance fall back towards Veliki Luki, Fortunately for them the German forces receive a fresh Panzer division and infantry units this turn which are railed to the front in support to halt the rout. Arriving siege guns from Kharkov allow a direct assault on Kalinin which is saved only by the NKVD and a two division cadred rump. However with no nearby replacement Political Troops or first line divisions this out of supply bulge in the line will safely be in German hands by the end of the month. 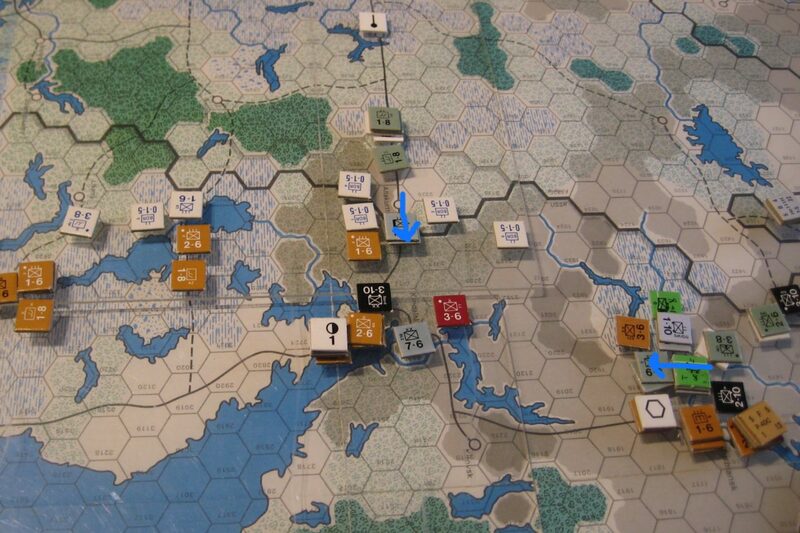 AGC: In an effort to wrong foot the Soviets the Germans launch a panzer/engineer/artillery attack against the central Moscow hex but after initial success the assault gets bogged down and after three days the operation is called off (NE). AGS: In front of the advancing Soviets infantry falls back to Kursk and Orel. Motorized units launch successful part winterized counter attacks against two stacks then fall back to stiffen the defensive line. 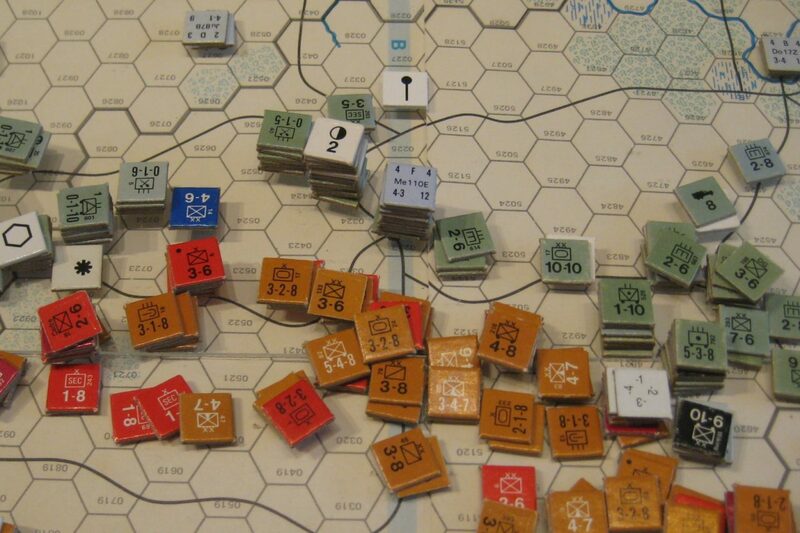 North East of Kharkov a fortified line begins to form a shield against a Soviet wheel south. 11th Army: Little ground action this turn and air raids directed against the river flotilla which the Soviets are now relying on to ferry supplies to Sevastopol fail to inflict the single hit needed to sink it. But at Odessa a hit cripples the Voroshilov. Air War: The Luftwaffe launch a comprehensive series of air missions against the rail network behind the Soviet advance devastating the net with 6/10 successful raids. In the north a similar operation north of Kalinin inflicts 2 hits out of 5 missions but operations south of Leningrad prove less successful with no hits being achieved.